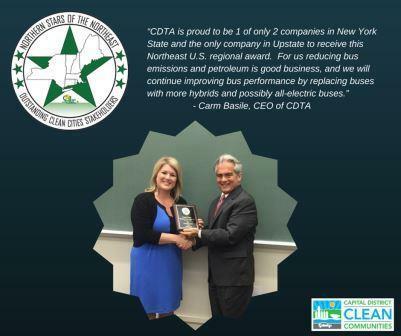 The Capital District Clean Communities Coalition (CDCC) is proud to award the Capital District Transportation Authority (CDTA) with the Northern Star of the Northeast award for its efforts in cutting carbon emissions, reducing use of petroleum, and promoting and utilizing advanced vehicle technologies to power its vehicles. The CDCC recognizes CDTA as a leader in green transportation. Not only has CDTA increased ridership to an all-time record high, but the 77 hybrid-electric buses in the CDTA fleet displace over 400,000 gallons of petroleum and 5,100 tons of greenhouse gas emissions annually. “CDTA has always been a transportation leader in our region and our State. So it is no surprise that they have earned this award, and that in the future they will continue to become more fuel efficient and to implement more advanced bus technologies,” said Michael Franchini, Executive Director of the Capital District Transportation Committee. The CDCC is the Albany-based Coalition under the U.S. Department of Energy’s Clean Cities program. There are nearly one hundred Clean Cities Coalitions around the country. The CDCC was established in 1999 to advance the Capital Region’s economic, environmental, and energy security by promoting the use of alternative fuels, advanced vehicle technologies, and policies that reduce petroleum consumption in transportation. The Capital District Transportation Committee (CDTC), the Metropolitan Planning Organization for the Capital Region, manages the coalition. The CDCC has about 85 members from both the public and private sector. CDCC members think outside the barrel by committing to reducing their petroleum use, promoting alternative fuels and advanced vehicle technologies, and advocating for idle reduction policies. The Northern Stars of the Northeast is a recognition program for the Northeast Clean Cities’ stakeholders that demonstrate a strong commitment to reducing their petroleum consumption through the implementation of various practices. The program is supported by Coalitions across New England and New York State. In order to be recognized as a Northern Star, a stakeholder must, at a minimum, use an alternative fuel in at least 30% of their fleet’s vehicles. This year seven Northeast fleets were selected as Northern Stars and six as Risings Stars. The award was presented to CDTA at the June 16 Coalition Quarterly Meeting at the University at Albany.